Two books with different ideas about our digital future: The Circle and Creativity, Inc.
Is there a hidden dichotomy between the two books The Circle and Creativity Inc? It says something about the present state of our connected lives that I’m considering them both as summer reading for our incoming Communication Leadership graduate students. One is a sunny West Coast dystopian novel about what happens when we surrender everything about ourselves to a monopoly. The other celebrates an increasingly necessary methodology in a world where authenticity has so much currency. Both speak to the inflection point we face as we quickly move beyond connection through our computers and smart devices to, well, everything. It’s the kind of methodology that led to the huge success of the first computer animated Hollywood feature. Thanks to this “Braintrust” approach, Pixar narrowly averted disaster, when under pressure from Disney the first cut of Toy Story had an edgy, mean Woody as the lead character. In two weeks, they turned the ship around. It’s a beautiful idea really, centered around the notion that collaboration and the sharing of candid opinion can lead to remarkable creative results. Compare that to The Circle, where the noose begins to tighten around the users (and employees) of a Facebook/Google-styled company that begins to track every human motion and utterance, ostensibly in the name of human advancement. The most fervent employees of The Circle are horrifically earnest and well-meaning. To obtain full citizenry (and thus the full benefit) of this ubiquitous social platform, you must share everything (turning off your personal camera only when you go to the bathroom or are in bed). To shore up this “there’s no such thing as Too Much Information” attitude, the company ultimately declares that “Privacy is Theft” — not sharing deprives the operating system that is humanity of vital information. I must admit relief therefore when I read the recent U.S. Supreme Court ruling on whether the police can search a cellphone without a warrant. The Court’s opinion was thankfully unanimous. 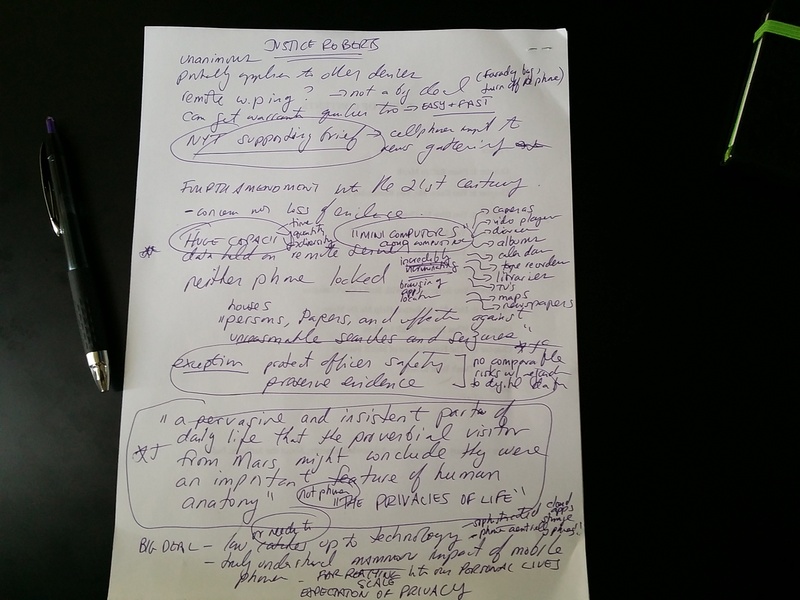 It concluded that a cellphone was actually a “mini computer” that was so expansive in what it held within that it contained much of our modern-day “privacies of life.” You can see from the notes that I took (ironically with pen and paper) that sum up this groundbreaking declaration how the Court so ably captured the scale of what these devices do. Ok, let’s accept this reality which has led to a recent public debate about the disruptive nature of technology at this particularly pivotal time in our history (that threatens everything from our jobs to how we get an education). What do we need to do to survive in this always connected, always digital “Next New World” as New York Times columnist Thomas Friedman put it at his recent conference? According to Dov Seidman, in this highly illuminating conversation, it hinges on new soft skills — “collaboration, imagination, creativity, leadership” tied to the values of integrity and truth. He may have indeed helped me choose which book to recommend to our students…and given me some hope.